No, only Seacrest Beach Club members who have received an invitation code can register. Click here go to our website’s registration portal. Enter your email (twice to verify), your last name (with first letter capitalized), and a strong password (twice verify). The strength indicator is provided to help users create a strong password, which is recommended. Lastly, enter the invitation code you received from the mass email sent to all members and click the “Register” button. You will be redirected to the site’s homepage, where you will be automatically logged in. I didn’t receive an invitation code, but I am a member. What should I do? The first thing you should do is check your email service’s spam/junk folder. Emails that aren’t spam/junk sometimes end up there due to various reasons. If the email from Seacrest isn’t there, then go to the contact page and request for an invitation code from the webmaster, being sure to use your primary email address in the form. If you are a co-owner of a home, then refer to the next FAQ. I am a co-owner, but I didn’t receive an invitation code. What do I do? There is currently only one invitation code per household. If you currently have multiple emails per residence on file with Seacrest Beach Club, then an invitation was sent to only one of those addresses. If you are part of a large family, then we prefer you share your credentials. If that will cause a major issue or if co-owners aren’t part of the same family, then go to the contact page and inform the webmaster of your unique situation. This means exactly what it says, that your email address has already been used to register an account in our database. So either you didn’t realize that your registration was successful or someone else used your email address. Either way, you should head to the log in page and try to access the site using your typical credentials. If that doesn’t work, then use the “Lost Password” functionality to create a new password. If you aren’t sure how to do this, check out the FAQ on lost passwords in the “My Account” section. Is my user information secure? Yes, we are using verified Starfield Technologies SSL encryption provided by GoDaddy (our hosting service). You will find the Starfield Technologies security seal at the bottom of our page, which also doubles as a link to our SSL certificate. Yes, by using the “Lost your password” link on the Log In page. The link is located below the email and password text-boxes. You will be sent an email to reset your password. Just follow the email’s directions and change your password. Though your password is not technically lost, this is the easiest method for members to change it. You can also just follow the direct link here. I have a new email address. Do I continue to use my old one for this site? No. Since we will be using email addresses registered to this site in order to contact members when needed, it is imperative that you keep the Club informed of any email address change. If you do get a new primary email address, please contact the webmaster on the Contact Page with this information and we will set you up with a new account. Use the “Lost your password” link on the Log In page. The link is located below the email and password text-boxes. You will be sent an email to reset your password. Just follow the email’s directions and change your password. What does “Remember Me” mean on the login page? Every time you log in to the site, you have the option of checking a box next “Remember Me” under your credentials. The key to this function is that it extends your session on the site from 2 days to 14 days, as long as you do not log off. So basically, if you finish your current browsing session and close the webpage or browser without logging off, then you still will be logged into the site when you return if it is within 14 days (2 weeks). Normally, you would be able to return within 2 days and still be logged in. The key to this, though, is that any time you log off, you immediately stop your session. So ticking the “Remember Me” box will have zero functionality. Just to add, there is obviously a security component to this topic. It is always safer to log out in terms of security and I suggest you do so if you are using any type of public computer. If you are at home and there is no security risk present, then it is up to you whether you want to stay logged in using the “Remember Me” functionality. If you want to stay logged in, then just don’t click “Log out” at the end of your browsing session. Do you have to enter a password to see documents anymore? You will no longer need to enter a password to see each individual document due to the addition of the member’s area. As long as you are logged into the site, you can freely see any document you want. I can’t find the documents section in the main menu. Where is it? If you don’t see a “Documents” link in the main menu (across the top of the site), then you are most likely not logged in. Click “Login” in the main menu, type your credentials, and hit “Submit”. If for some reason, you just logged in and can’t see the “Documents” link, that is most likely a cookie issue. Just refresh the page (or hit F5) and the “Documents” link should appear. If not, contact the webmaster. What is the best way to save a document to my computer? Simply right-click the file link (with the mouse or mousepad) and click “Save Target As” or “Save File As”. I am confused by the mobile version of the site. How does it work? In order to access the off-screen elements, you have two options. You can either press the menu symbol or temperature value on either side of “Seacrest Beach Club” title at the top of the page or you can simply use your finger to swipe left or right. Why does the site look different on a phone or tablet? With the majority of users owning some type of mobile or tablet device that requires the use of gestures, it is important to have a completely responsive version of your website without losing any content. The mobile version of the Seacrest site does exactly that and should be seen on all tablet and mobile devices. If you have a mobile device that either doesn’t have the mobile site or the actual page is rendering incorrectly, please contact the webmaster here with the device you are using. Why is there a 404 error when trying to access the camera using the iPhone screen icon? When the website’s server was updated (3/24/2014), the link to the camera also changed. You should delete the current iPhone icon by first holding down on it and then hitting the “X” when the icon starts jiggling. 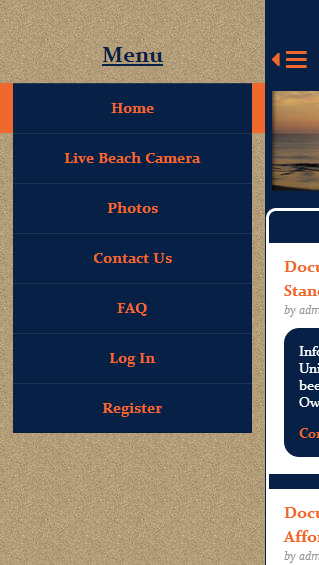 Next, go to the Seacrest website in Safari (on your mobile device) and surf to the new camera site at http://www.seacrestbeachclub.org/wp/camera/. Finally, click the middle icon on the bottom toolbar (i.e. rectangle with curly arrow) and select “Add to Home Screen”. There should be new icon on your iPhone screen that successfully connects to the camera. I have an iPhone. How do I create an icon to directly go to the Seacrest live camera? Go to the Seacrest website in Safari (on your mobile device) and surf to the camera site at http://www.seacrestbeachclub.org/wp/camera/. Click the middle icon on the bottom toolbar (i.e. rectangle with curly arrow) and select “Add to Home Screen”. There should be new icon on your iPhone screen that successfully connects to the camera. I just bought a home in Seacrest. How do apply for membership? 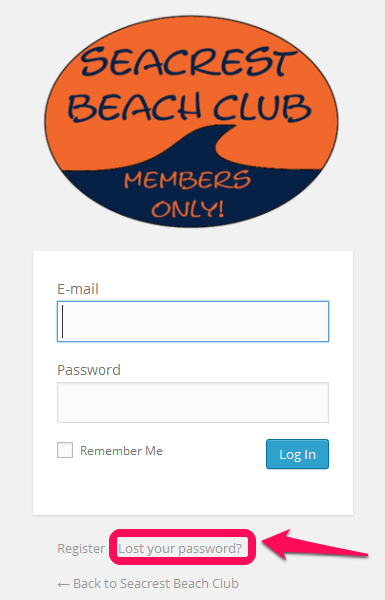 Use the link below to download the Beach Membership Application form. Fill out the form, follow the directions within, and mail it to Seacrest Beach Club’s P.O. Box printed at the bottom of the form. It is also important that you read and familiarize yourself with both the Seacrest by-laws and beach club rules. Download links for both are also found below. I am an owner and I need a new beach flag. Who do I contact? 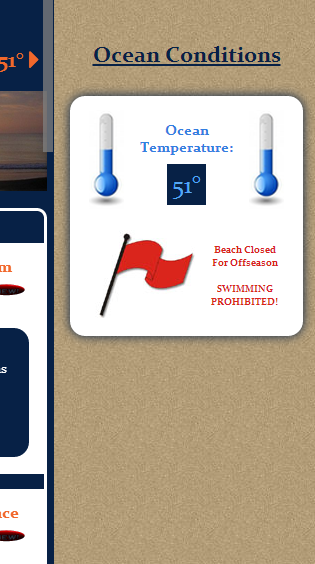 Send a message (using the contact page) to the club President requesting a new beach flag. The fee for a replacement beach flag is $50, which should be made out in check form to “Seacrest Beach Club” and sent to the P.O. Box address shown at the top of the contact page. I just bought a home in Seacrest. How do I get a flag to sit on the beach? This information is listed on the Beach Membership form. There is a one-time initiation fee of $150 and beach flag fee of $50. Send a check to Seacrest Beach Club’s address shown on the website’s contact page. I am a renter. How do I obtain a rental flag in order to sit on the beach? This will depend on whether you rented privately or through the rental agency. Either way, visit the lifeguard stand on your first day with a $20 refundable deposit. If you rented privately, the lifeguards will have your name on a list. If you rented through the agency, then the you should have received a voucher, which you should give to the lifeguards. RSS (or Really Simple Syndication) allows you to get Seacrest Beach Club posts in real time using an RSS reader. The most famous RSS reader was Google Reader until Google retired it on July 1st, 2013. The majority of Google Reader users moved to Feedly, if you are interested in exploring RSS readers. The readers allow you to collect news from an infinite amount of sites (in real time), so you can read them in one place. Where did the rules page go? 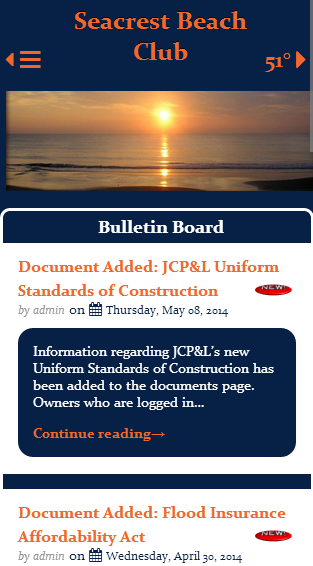 The rules and regulations have been moved to a PDF document in the Documents section. Just log into the site and you will have access to it. I would like to share photos with the site. How should I go about doing so? Since you cannot attach photos to the form on the contact page, then email the photos to the webmaster directly at seacrestbeachclub@gmail.com. If you have many photos and feel somewhat comfortable with computers, then use a free tool like 7Zip to add them to a zip file and attach the zip file to the email. Attaching all the photos to the email is fine as well, but can be quite time consuming. When are the lifguards on duty? The lifeguards begin working in the final week of June and finish up on Labor Day weekend. They are on duty from 9:30 am to 5:30 pm daily. In terms of the ocean and swimming, what do the different color flags mean? Green → The lifeguards have determined that ocean conditions are ideal for swimming. Yellow → The lifeguards have determined that swimmers should use caution when swimming due to strong currents, big surf, etc. Limitations are often put on your swimming for your own safety. Currents in the ocean are dangerous and our lifeguards know best. Listen and respect these limitations, as the lifeguards are experts in this area. Red → The lifeguards have determined that that the ocean conditions are too dangerous for swimming due to strong currents, big surf, etc. The ocean is off-limits to swimmers. RAFTS → The lifeguards have designated an area where all swimmers using rafts, boogie boards, etc. should stay. Please respect these areas as they have been chosen specifically due to the current ocean conditions and to ensure the safety of swimmers. Interested in full water reports performed by the Ocean County Health Department? Please click here for further details. Buying or Selling a Home in Seacrest?? Please read this.